Run Your Socks Off! FREE Fun Run May 9th 6:30-8:00 p.m.
Join Roadrunner’s of Kansas City and CoachAmyPT for a walk/run for charity. The event is FREE with a donation of socks for Cornerstones of Care. Bring your family and friends, wear your crazy socks, and walk or run for up to 50 minutes on the Trolley Trail, starting and ending at Betty Rae’s Ice Cream in Waldo. A raffle, prizes and discount ice cream from Betty Rae’s will conclude the event. By checking in at the registration table, participants are entered into the raffle drawing for a FREE month of RRKC Saturday Group Runs. 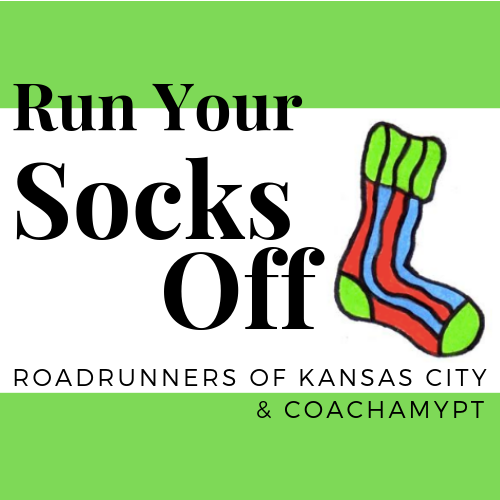 This run is FREE, but registration is required, and all are encouraged to donate socks! All participants must register at the following link below to reserve a spot. May 9th, 6:30- 8:00 p.m.
Meet at Betty Rae's Ice Cream in Waldo (7140 Wornall Rd, Kansas City, MO 64114), check in at the registration table upon arrival. Run or walk the Trolley Trail north for 25 minutes and turn around. Feel free to run or run/walk a shorter period of time. Enjoy the outdoors, and spend time with family and friends as we help our greater KC community with this weekday workout!